HI 9812-5 is a pH/EC/TDS waterproof meter designed for simplicity in taking pH, µS/cm, ppm (mg/L) and temperature measurements. The HI 9812-5 is ideal for hydroponics, greenhouses, farming and ground water applications. 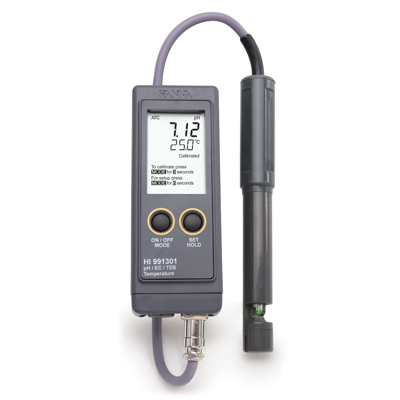 No probe changes are required when switching your measured parameter between pH, conductivity and TDS. These multiparameter meters reduce the number of instruments required for daily water quality analysis. 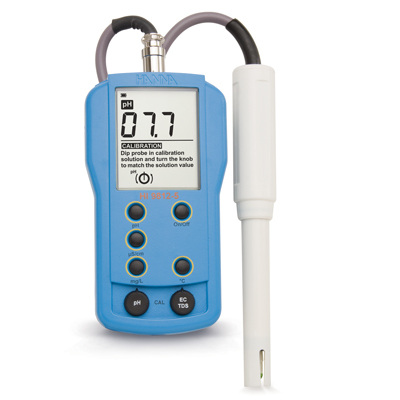 The specially engineered HI 1285-5 pH/EC/TDS and temperature probe utilizes a fiber junction and gel electrolyte which provide a fast response and reduced contamination. This combination makes the HI 1285-5 particularly designed to withstand harsh environments such as fertilizer solutions. HI 9812-5 is supplied with HI 1285-5 multiparameter probe, HI 70007 pH 7.01 calibration solution sachet, HI 70032 1382 ppm (mg/L) calibration solution sachet, HI 70031 1413 ?S/cm calibration solution sachet, HI 700661 electrode cleaning solution sachets (2), battery, instructions and rugged carrying case.